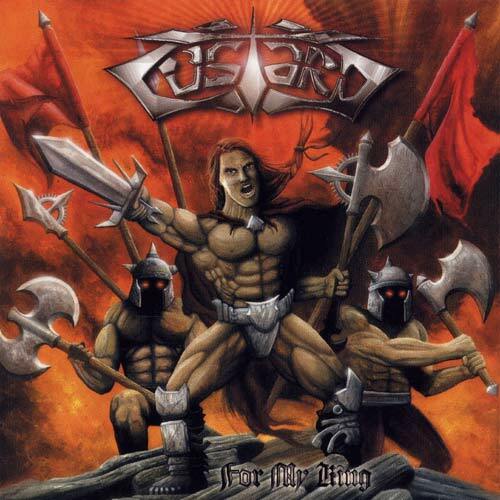 Despite their rather poor name, Custard play an exciting brand of speedy Teutonic power metal. As with a lot of stuff in this genre it’s certainly not very original. However, lack of originality isn’t much of an issue when a given band plays this sort of music as well as Custard. As has been stated thousands of times before – if you’re looking for something original, the power metal genre is likely the very last thing you’d try. People don’t listen to power metal for its originality, but they listen to it because it’s fun, exciting, and emotional (when done right, of course). With this in mind, Custard’s 2000 release should please a lot of power metal fans. I always love finding lesser-known bands that have great singers, and Custard’s singer, Guido Brieke, is very good. He often sings in a mid-range style but also successfully employs a high-pitched wail that complements the songs in various spots. Actually, his vocals are very crisp and smooth while still retaining the ability to convey power and emotion. In some spots he reminds me a bit of Daniel Heiman in the way that he sounds so composed and relaxed while belting out memorable melodies. That’s not to say he’s as good as Heiman (very few singers are), but it is still a compliment. Also, if by chance you’ve heard the band Skanners and their “Flagellum Dei” album, Brieke sounds a bit like the singer on that album. Take a song like “Charon’s Call”, for instance, and note how Brieke sounds during the slower verse parts – entirely relaxed yet just emanating power and feeling. A lot of power metal singers sound as if they’re always straining themselves, uncomfortably forced to utilize a style they’re really not suited to. Not so with Brieke – he is a pleasant surprise on this album and simply fun to listen to. The music is not quite as strong, though by no means is it bad. We have the usual mixture of influences, including Gamma Ray (especially the speediness), Helloween, and so on. With plenty of sing-along choruses, blazing guitar solos, plentiful double bass work, etc., this disc contains nothing we haven’t heard before. Actually, I think the most effective parts are when things slow down a bit, especially on the aforementioned “Charon’s Call”, a truly excellent mid-paced song with great vocals and guitar work. Of course, the speedy stuff is fun too, as on the ripping “Up to the Sky” which features a nearly endless amount of double bass pattering. You may want to stay far away from “Deliver Me”, however, as it’s a ho-hum ballad with embarrassingly bad lyrics that could have easily been ripped from American Idol – yeah, it’s that bad. As for the production, the drum sound could have been tweaked a wee bit. The bass drums sound a little odd, lacking the necessary force and richness found in great production jobs. Otherwise everything’s solid, especially the guitars with their nice sharp edge. At first glance it would stand to reason that this release would reek of mediocrity. There’s the laughable cover art, not to mention the questionable band name. Also, the lyrics are certainly nothing special. And really, who’s ever heard of any of these guys? Unknown power metal bands are truly a dime a dozen these days, and most of them just are not very good. Well, forget all of this stuff because “For My King”, despite the noted problems and mountain of cheese it comes with, is tons of fun and highly recommended for fans of fast power metal that is light on keyboards, bands ranging from Gamma Ray to Iron Savior to even Dragonforce, though it’s not that fast. Just enjoy it for what it is – enjoyably crunchy power metal done surprisingly well.